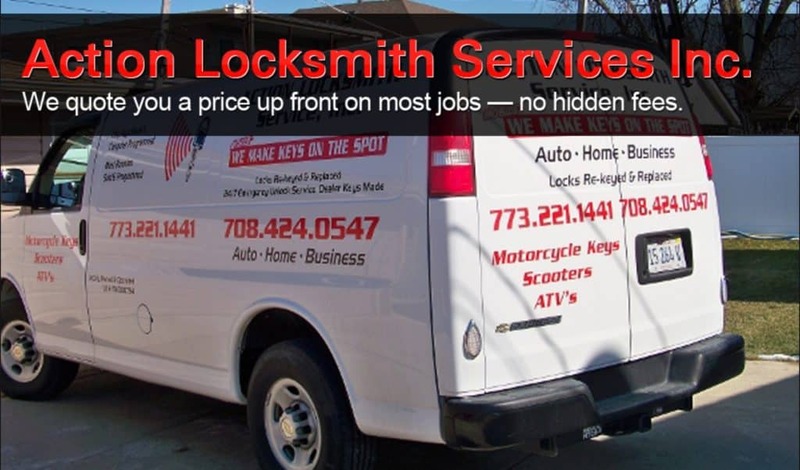 Action Locksmith Services of Oak Lawn, Illinois is a certified provider of residential, commercial, and a wide range of automotive locksmith services at affordable, up-front prices, 24-hours a day, seven days a week. Our mobile technicians offer rapid response to locksmith needs, emergency or otherwise, in the areas of Blue Island, Chicago Ridge, Evergreen Park, Frankfort, Justice, Lisle, Midlothian, Oak Brook, Orland Hills, Orland Park, Palos Heights, Palos Hills, Palos Park, Park Forest, Tinley Park, and Worth, Illinois. At Action Locksmith, our customers have been priority one for more than 16 years! Action Lockout has expertise and experience to solve almost any automotive lock and key problem, from cars and trucks, to motorcycles and ATV’s, to RV’s and boats and semi-trucks/heavy construction equipment. Action is the first and only call to make for your automotive locksmith needs. If you are locked out of your car, don’t wait for hours a locksmith who will bury you in hidden fees – Action Locksmith will respond rapidly and never hide fees for services. We offer fast and affordable lockout services, lost key replacement, stuck ignition service, broken key extraction, and on-site transponder key chip programming. Our mobile technicians in Oak Lawn will come to you in a hurry, so you never have to worry about expensive towing and dealer fees. And if you need a new car remote or your current remote re-programmed we carry most models. Action Locksmith even makes and repairs motorcycle and ATV keys. Whether you have a scooter or a Harley, we make the keys you need, as well as help with broken keys and other issues – on-site in an emergency. With our guarantees of no hidden fees and reasonable prices, why trust your bike to anyone else?